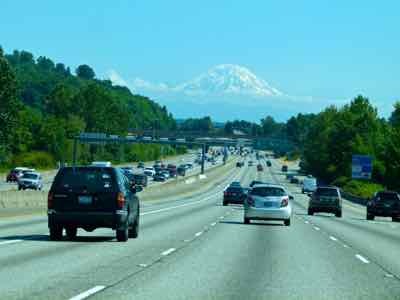 If you're going to visit the US outside of the major cities, the US highways will be a major part of your experience. ...US Highways... and State Highways. Anywhere in the world that you’re driving, you have to get used to the system. The Interstate highways keep thing consistent, but in the case of State Highways, numbers or names that may change at the border. So let’s try to make sense of American Highways. Ask an American for directions, and it might get a little confusing for visitors. "Get on the freeway to San Francisco." There you have three different answers to the same questions... AND... They all mean the same thing! So what is a tourist to do? Well, for one thing, make sure to ask another question if you're confused. Refer to your map. And it's probably best to go with the number of a highway as identification. You may or may not see directions for the Bayshore Freeway on road signs, but you will see 101 North or South. Many highways have local names that aren't well known to others. 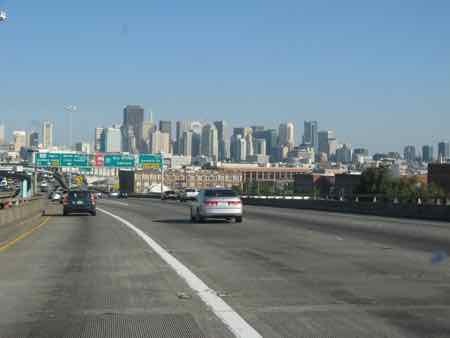 Most major highways in the U.S. are free... freeways. Some may charge a toll... tollways. If you look on a map, you will find toll roads marked so you can be forewarned. Major cities with lots of traffic congestion often have circular freeways surrounding them... Beltways. I mean, if you're not staying in a city, there is no reason to go through the hassle of driving through it. To try and bring some order to this vast tangle of highways, they are numbered. North-south highways have odd numbers. East-west highways have even numbers. Interstate Highways are shown on maps with their numbers on a red and blue shield. US Highways have a their numbers on a white shield. State Highways are also numbered.... They are usually shown with a number on a white oval. They may overlap U.S. Interstates or Highways in places... with a different number! If you're traveling on a highway that has more than one number designated on the map, go with the number of the national highway you want to follow. Road signs will most often give you all the options, but how many numbers can you really keep in your head when you're navigating in a strange place? Things like the Blue Ridge Parkway through The Great Smokey Mountains, The Great River Road along the length of the mighty Mississippi River, or the Daniel Boone Heritage Trail that follows the travels of this legendary frontiersman. Whether you're using the US highways to get from one region to another or traveling a scenic highway, make sure you know your numbers and direction, and you'll have a great time joining in a great American tradition.... the road trip.